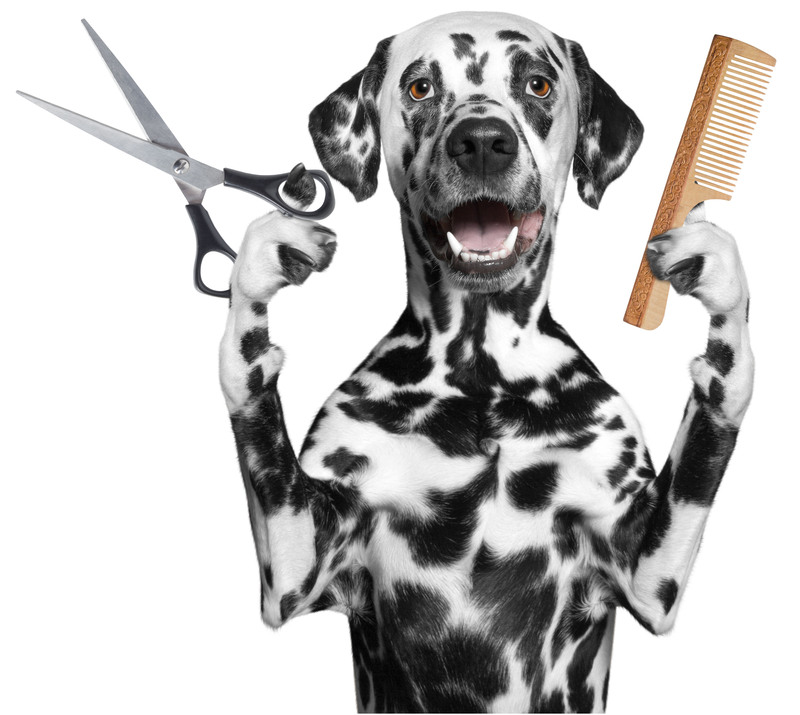 If your passion is pets then dog grooming should be your career! How would you like to learn from a team of two, 20+ year, veteran-professional groomers teaching you the ALL the skills, tips, & secrets only the Pro’s know? That’s what you will experience the moment you begin to participate in our 95% hands-on home-study training lessons. It’s very possible your success will be attained in just a few short weeks, AND starting on a low shoe-string budget! We’ll create confidence in you that you never knew you had! 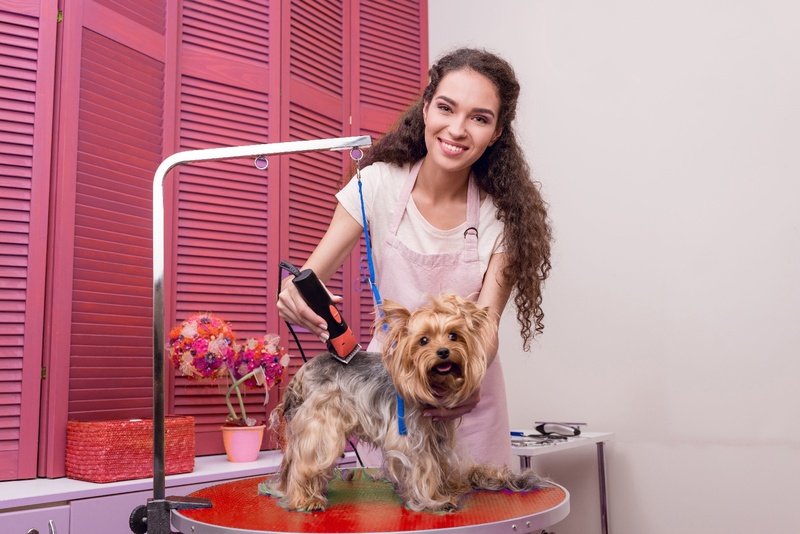 Your Pet grooming training is now within your reach and no previous experience or education is required! 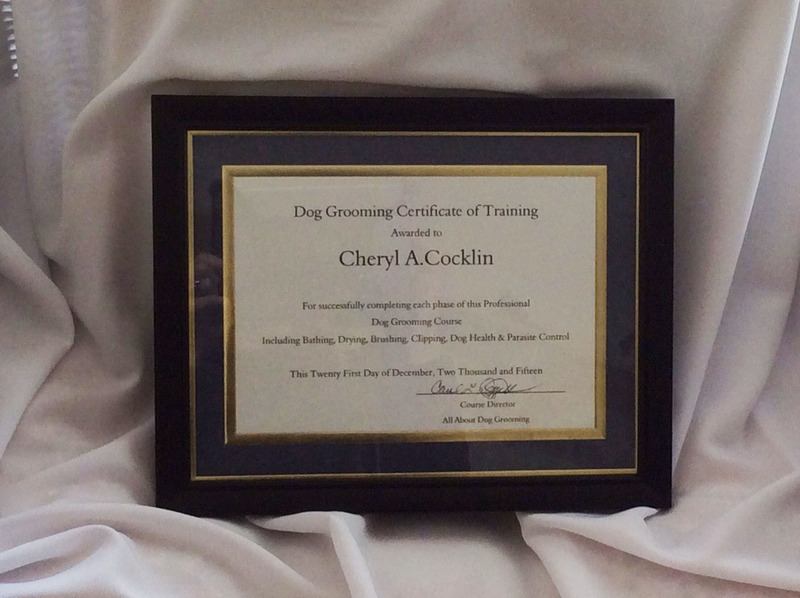 What is The All About Dog Grooming Course? 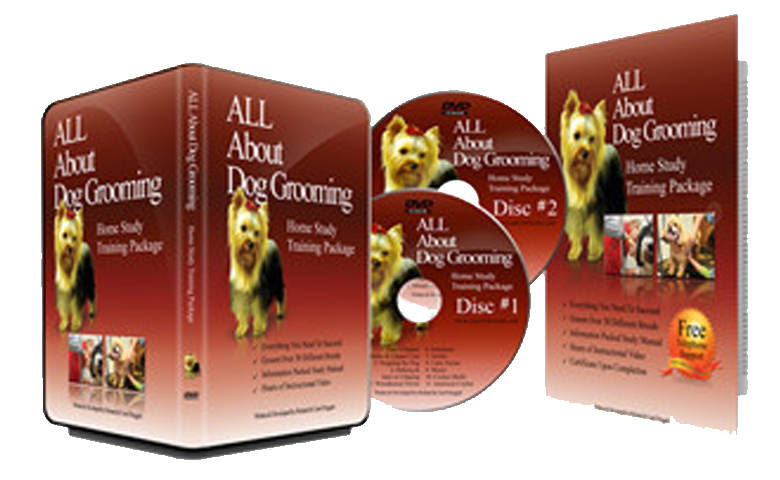 Why should you get Dog Grooming Course? 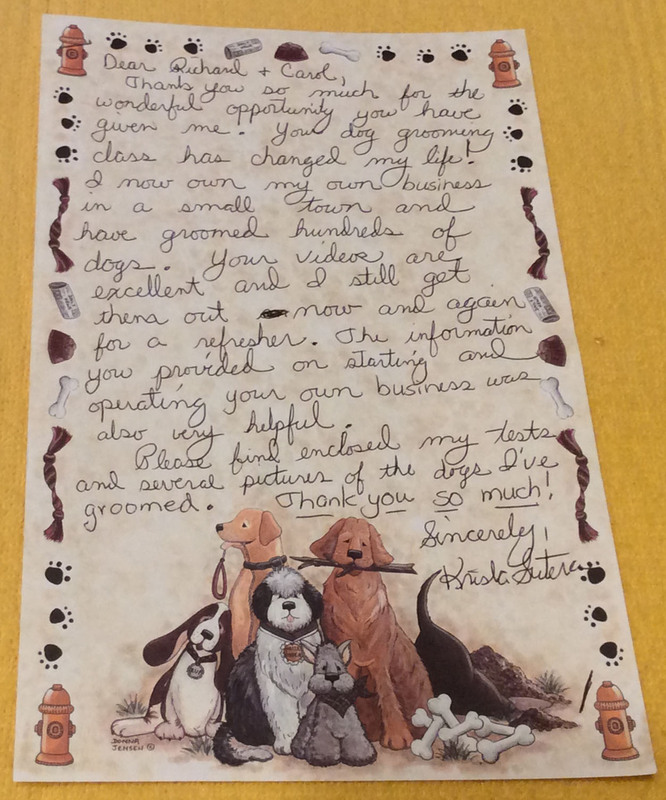 Why become a dog groomer? The perfect reason.. You’re an animal lover, so why not enjoy your days working with them in a new, emotionally rewarding career! 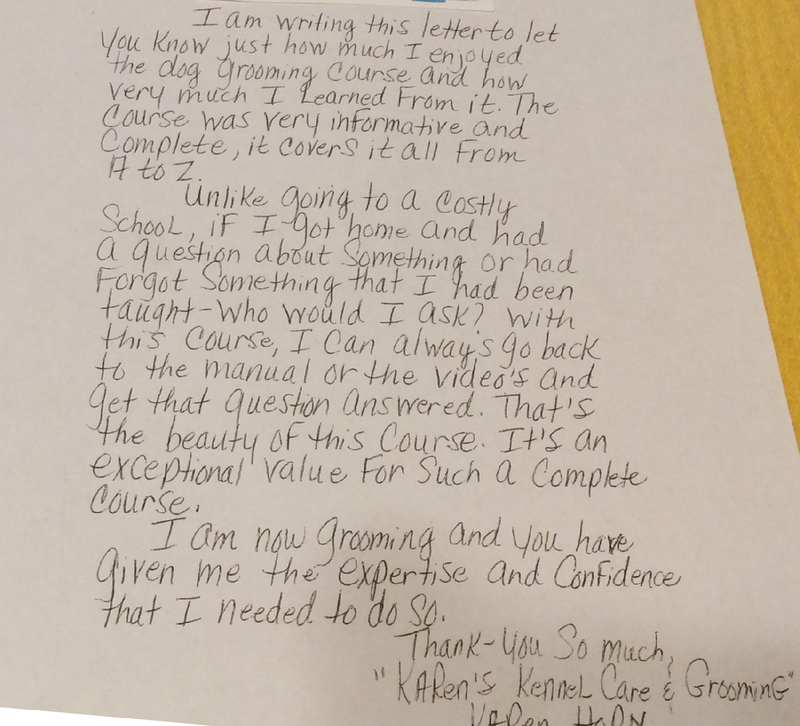 How does Dog Grooming Course work? 21 chapters with Chapter Tests to enhance your learning. Grooming Chart covering 20 of the Working breeds with grooming instructions and bath frequency charts. You will feel as though you are with us in person teaching you by our side! Our tapes are produced and dubbed by an excellent videography company on high quality DVDs designed for heavy use. The lighting and camera shots capture each lesson with clarity. They are packed full of quality instruction!! From this training you will be shown how to properly bathe, blow-dry, clip and scissor style over 30 of the most popular breeds. Here are just some of the breeds you’ll learn groom..
Our dog grooming training package is very thorough and quite honestly, questions seldom come up. Our one-on-one, life-time assistance will be a valuable asset to you. We pride ourselves on how efficiently we personally handle inquiries. We have a toll free phone system in place that rings us up almost anywhere we are. You will not get a phone operator... but will always speak with one of us. You may also choose to email us if you desire... but there are always times when you need to speak to a real person! 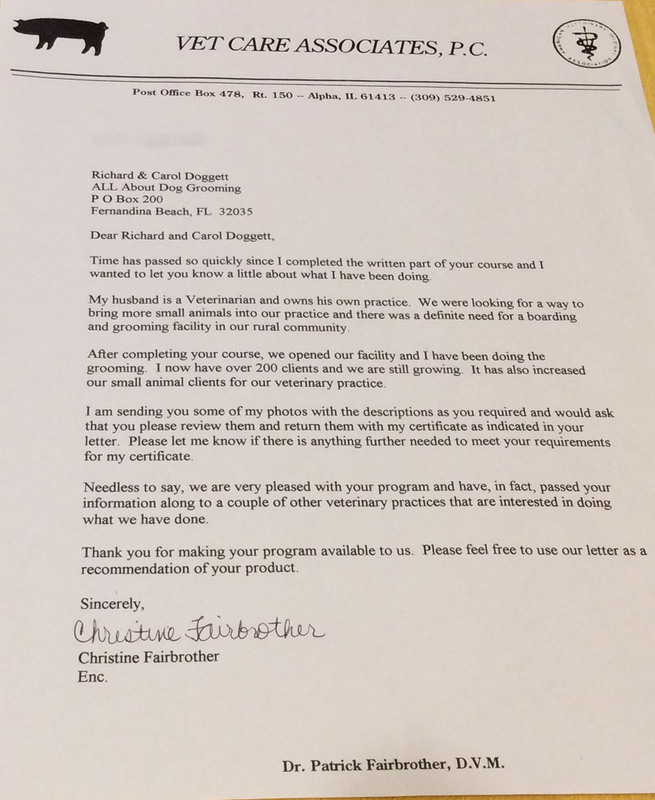 Once you complete our course, show quality and proof of your grooming knowledge to future customers. "What an exciting book of information! I just want you to know, I will be referring your services to others. I really enjoyed the course! I wish I have done this years ago!!! Thank you." "I really like the videos. They are very concise and clear. Thank you for creating this home study course. It's a boon to distance learning. Also, very affordable." "This should be used to tell a story and let your users know a little bit more about your product. 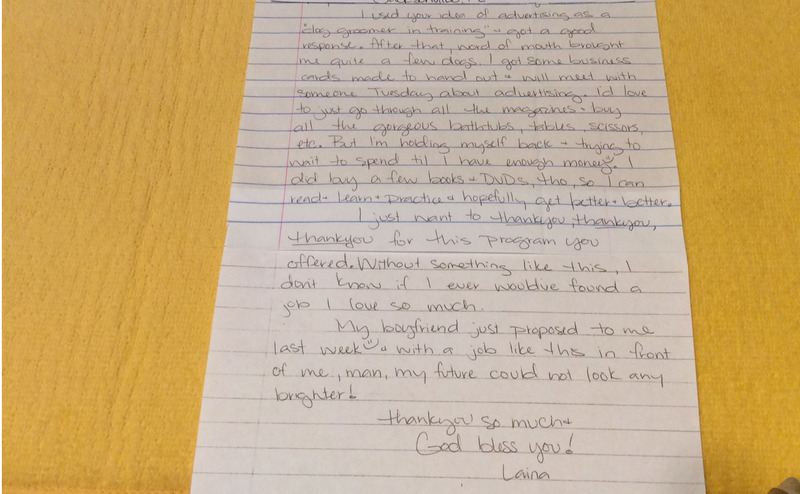 ""I am writing to say thank you again for all the time and experience you shared with me. Your materials are very complete and I refer to the manual and videos daily for help. 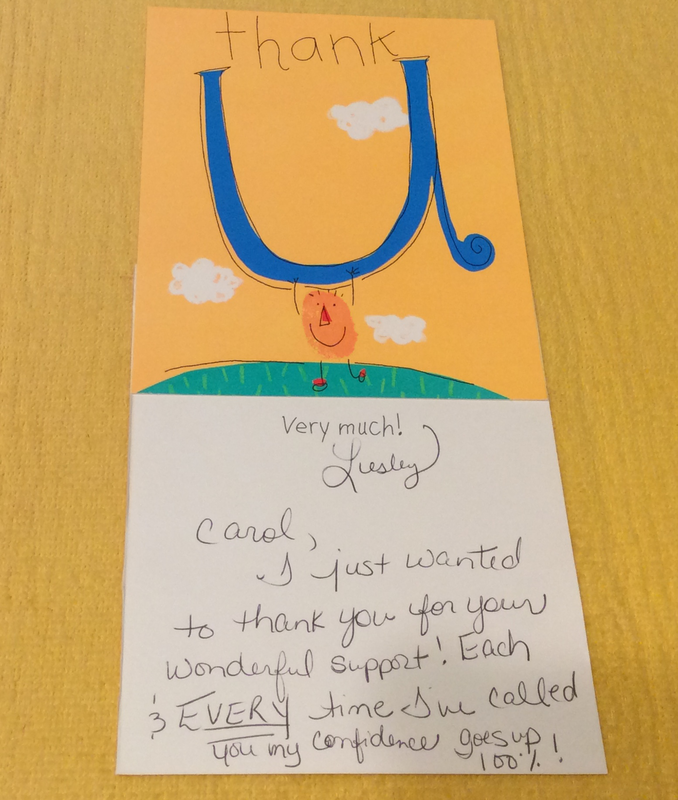 Also Carol thank you for the unhurried time you spent with me on the phone! I have been open one month and I already have over 30 costumers. Most have made 2nd appointments. Keep selling these teaching materials because they are excellent. All I have learned is through them and you. I wish I had started years ago - it's a very rewarding career." "What an exciting book of information! I just want you to know, I will be referring your services to others. I really enjoyed the course! I wish I have done this years ago!!! Thank you. 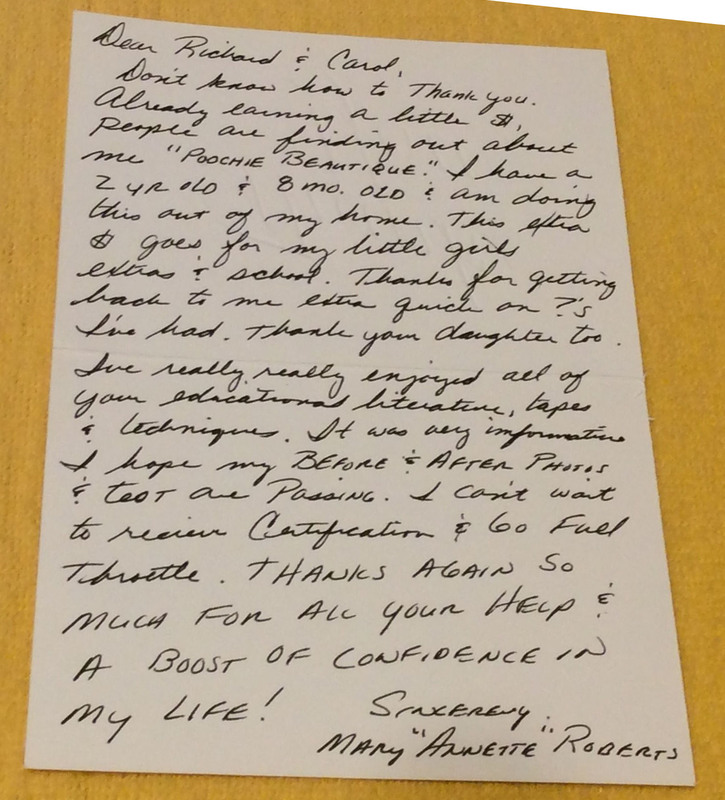 "Hi Carol, I received the packages today and boy are they great! I could not stop watching the first learn to groom DVD. Then I was reading the handbook, oh my its full of so much great information. I forgot to mention that I worked in a vet hospital for 11 years and have been a licensed veterinary technician for 5 years. I have an extensive background in dogs and cats and could tell right off the bat that this was going to be a great course!I cannot give you and Richard enough kudos! I'm so excited for my new career! And am extremely satisfies with my decision with your materials. Thank You!